Environmental Sensors: These sensors provide environment details like light sensor, proximity sensor, temperature sensor, etc. Motion Sensors: These sensors provide motion information acceleration, rotation etc. Software based sensor: These sensors are not physically available in the device, but appear as though they are physically available. Software based sensors derive or calculate their data based on one or more physical sensors. These types of sensors are often called virtual sensors. The Android gravity sensor is the best example of the software based sensor as it is derived from the accelerometer data. Android continues to evolve and new sensors are added to the system definition as time progresses. The table below outlines the sensors commonly found in Android based mobile devices as of Android 5.0. Remember, not all mobile devices contain each of these sensors. The Android Compatibility Definition Document (or Android CDD) defines which sensors are required vs. optional as well as tolerance details for each. This means OEMs have some latitude to pick which sensors are present in a given device. For example, the Samsung Galaxy S5 includes a heart rate sensor as well as a hall effect (magnetic field) sensor, but not all other Android devices may include these specific sensors. 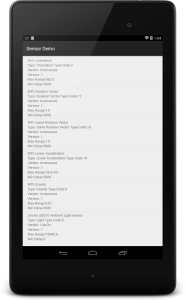 See Section 7.3 of the Android CDD for more information on required vs. optional components. In the demo application, I’m going to display a list of all sensors present on the device. Each device is different, so a good first step when dealing with sensors is to get a list of all sensors or a list of all sensors of the type needed. To do this, we call the manager’s getSensorList() method. It will return an array of Sensor objects. Each instance of the Sensor class represents a single sensor and relevant information. The Sensor class contains constants for each of the sensor types defined by the system. To retrieve all sensors we need to use Sensor.TYPE_ALL constant. From here we can examine each sensor in the system. The Sensor object provides us with details about the specific sensor, such as its name, type and vendor. For our purposes, we are going to log this data and also display it on screen using a ListView. For brevity, the code below logs each sensor’s information. onSensorChanged: when the sensor reports data to Android, the system calls back our class with the data encapsulated in a SensorEvent class. The SensorEvent object contains information about the sensor data including accuracy of the data, the sensor data and timestamp at which the data was received. The data itself is device dependent and provided as an array of floats. onAccuracyChanged: if sensor accuracy has changed, the system notifies the listener at this method. Accuracy is represented by one of four status constants: SENSOR_STATUS_ACCURACY_LOW, SENSOR_STATUS_ACCURACY_MEDIUM, SENSOR_STATUS_ACCURACY_HIGH, or SENSOR_STATUS_UNRELIABLE. In order to start receiving data for the sensor, an instance of our app’s SensorEventListener needs to be registered with the SensorManager via the registerListener() method. At this point in time we can also request the frequency at which we receive sensor data. Note that the frequency is simply a request to the system, it is not a guarantee. To assist with specifying the frequency, the system provides several constants: SENSOR_DELAY_NORMAL, SENSOR_DELAY_UI, SENSOR_DELAY_GAME, and SENSOR_DELAY_FASTEST. You can also specify your own frequency, in microseconds. When the app no longer wishes to receive data, it must call the manager’s unregisterListener() method. From an Activity, it usually makes sense to register in onResume() and unregister in onPause(). Now that we are receiving sensor data and have the details, we can display it on screen and also watch the data change. In the case of the light sensor, you should be able to find it near the top of your device. Below, I’m using a Nexus 7 (2012) where the light sensor is near the top-center of the device. The raw data value is changing because I’m moving my finger in front of the sensor then away from it repeatedly. We’ve now taken a quick look at the basics of using Android sensors. The first step is getting the SensorManager. From there we were able to detect sensor devices present on the system and show some details about them. Given a specific sensor, it is straightforward to ask that the system notify the app of any new data values. Next time I’ll explore some of the more advanced usage of sensors, such as power management considerations, trigger events and wake events. Skip is a senior Android developer for HIQES.